Erhalten Sie eine umfassende Tour zum Miracle Square auf dieser Wanderung in Pisa. Mit einem Führer, der Ihnen den Weg weist, folgen Sie einer sorgfältig kuratierten Reiseroute, die sicherstellt, dass Sie alle Sehenswürdigkeiten wie die Kathedrale und das Baptisterium treffen. 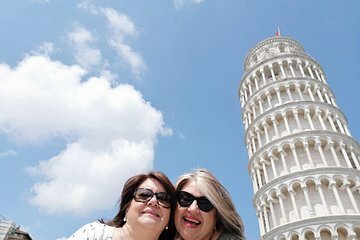 Diese Tour beinhaltet einen wertvollen Einstieg in den Schiefen Turm von Pisa, der Ihnen eine Menge Urlaubszeit erspart. A great and thorough review of the baptistry, cathedral, and leaning tower. The tour guide was funny! I was amazed seeing these beautiful white marble buildings from afar. I cannot remember the name of our tour guide, but she was amazing. It turned out, my friend and I were the only ones signed up for the tour! So it was a private tour for 2! The inside of the Cathedral is unbelievably gorgeous! Our tour guide pointed out some interesting facts about the buildings. I did not sign up for the tower climb but I highly recommend this tour for those interested in the Baptistery, Cathedral, and Leaning Bell Tower!